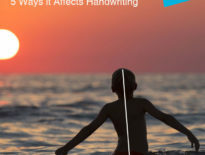 Teaching Cursive Handwriting: Why Don’t Our Children Stick With Cursive? Over the past number of years it seems that cursive handwriting has, in some circles, fallen out of favour. There seems to be little time during the school day for teaching cursive handwriting and many note that so many children seem to revert to printing as soon as they are given the choice. 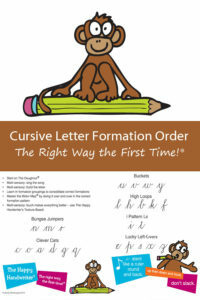 There has been much media attention in the international press regarding the teaching of cursive handwriting. This has been precipitated discussion around whether to abandon the teaching of cursive handwriting to make way for keyboarding skills. Cursive handwriting was taken out of the common core curriculum in the USA, only to find that one by one, states are mandating its return. Here in South Africa, while it is in the CAPS handwriting curriculum, it seems pretty much a free for all. It is left up to individual schools to decide whether or not to include it. And for those who do, they are finding that by Grade 7 so many of the children are choosing to revert to print. Whilst the teaching of keyboarding skills is critical and needs to assume its rightful place in our curriculum, we cannot allow our children’s handwriting skills to be compromised. Examinations throughout the schooling years, as well as those in tertiary education require our children to commit their knowledge to paper. We need to ensure that they have the handwriting skills to do this. Research has shown that it seems that a mixed cursive script (mostly cursive with a few printed letters) is the most efficient in terms of speed and legibility. The teaching of cursive handwriting has been criticised as many learners revert to the use of print as soon as the school system allows it. The reasons for this can be debated but fall into two main categories. Firstly, our children are required to use cursive script for all their written work before it has become well-consolidated and ‘hard-wired’. This probably stems from insufficient time available for teaching cursive handwriting. They learn the letters but do not have sufficient time for practising writing paragraphs in a formalised handwriting lesson setting. They often dive straight into having to copy work off the board and get the task done. This is setting them up for failure as the motor maps for cursive handwriting are not sufficiently well established in the brain. Secondly, the learners are often allowed to make the choice for themselves as to whether they proceed with cursive handwriting or revert to print in the latter Grades of the intermediate phase. In this particular instance, our children do not have the knowledge or foresight about the future impact of their handwriting and are not equipped to make such a decision. The use of cursive script in the intermediate phases needs to be non-negotiable to allow the script to become ‘hard-wired’ and achieve the speed and flow that is required for future examination situations. 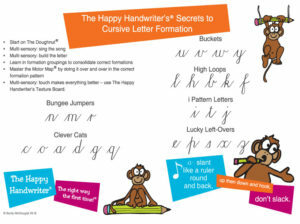 This needs to be one of the non-negotiables of how to teach cursive handwriting. If we are going to allow our learners to choose as early as Grade 5, it is probably best that we do not invest valuable teaching time in this skill earlier on, if they are never going to make use of it. Teaching Cursive Handwriting: In or Out? We need to decide if we are in or out. There are followers of this Blog who are OUT! And that is fine. They have made their own informed decision. But if we are in, we need to be in. We need to make it mandatory for our children to continue to use cursive until Grade 7 to ensure that it has matured in its automaticity and is “hard-wired.” That way, our children will be comparing apples with apples when it comes to making the choice in high school. There is no doubt that social issues drive this decision, particularly in girls. If their friends revert to printing, then they do too. But, it doesn’t take long for them to realise that the note taking is extensive and they will choose based on what is faster for them, rather than what their friend is doing across the way. When it comes to cursive writing for kids, they are able to make their own decisions if each option is given its fair place. This brings us to the question that if we are going to keep on teaching cursive handwriting, how are we going to do this while still allowing for time for the acquisition of keyboarding skills? We need to apply what we have learned from motor learning theory, and not rely on tradition to govern our teaching methods for cursive handwriting. In addition, we need to use a multisensory handwriting approach. The two common stumbling blocks to mastery of cursive handwriting is an inability to recall what the letter looks like, followed by an inability to remember how to form the letter. Our children need to be able to automatically retrieve a visual picture of what the cursive form of the letter looks like. If they have to refer to the classroom wall-frieze or a memory aid on their desk, they are going to struggle to achieve automaticity in this skill. The Happy Handwriter effectively uses a memory game to establish the visual picture of the letter form. The pair is made up of the lower case and cursive letter from. Later on, the pair is the lower and upper case cursive letter form. If your child has to stop and think what the letter looks like then they will certainly benefit from going back and spending time playing the memory game until they can do it without thinking. 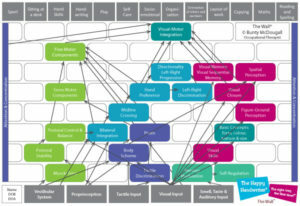 Multisensory is not just for Pre-schoolers and Grade ones. Research has shown there to be a mismatch between the developmental levels of the children and the teaching methods. It has shown a traditional watch and copy approach is not the most efficient way to establish handwriting, even with older children. They need the additional sensory input, in just the same way our preschoolers and Grade 1’s do. So, when it comes to teaching cursive handwriting, we need to utilise a multisensory approach which we follow in The Happy Handwriter cursive handwriting programme. Study.com has a video that talks about different styles of cursive handwriting used in the USA. Once letter forms have been mastered we go on to promote fluency with link ups and speed of cursive handwriting. Only then are out children ready to use cursive handwriting for their subject based tasks where speed is required. If we follow these principles, cursive handwriting will become automatic and “hardwired” which will set the stage for life-long use of cursive, should our children choose to use it.